re you looking for a way to start the new year, possibly with family devotions? I just received The Gospel Story Bible: Discovering Jesus in the Old and New Testaments and I highly recommend it. It is a nice, brightly colored hard-covered book, with over 300 pages. It covers Genesis through Revelation in 158 stories and clearly presents God’s plan of Salvation. Each story ends with “Let’s Talk About It” which includes three questions for discussion. 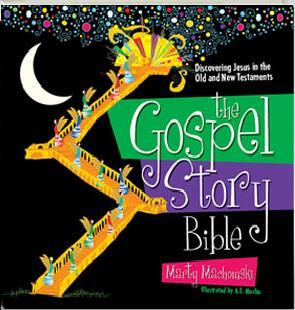 The stories are short enough to keep a child’s attention, yet detailed enough to give the accurate story from the Bible. The stories ends with how it pertains to us now and the need for God’s salvation. This book is also very much eye captivating! Each story page is a different glossy color and has modernistic type colorful drawings. I am very impressed with The Gospel Story Bible and believe it would be ideal for most homes and would make a great Christmas gift! from The B & B Media Group, Inc.
in exchange for posting my honest review and opinion. Below is more information provided by The B & B Media Group, Inc. Sometimes it’s easy to forget Jesus in the midst of frantic schedules, family squabbles and conflicting priorities. For many Christians, God often becomes little more than an afterthought after days absorbed and depleted by the busyness of life. But the truth is that he is the hero of every story—including the mundane, ordinary ones we experience on a regular basis. That is why Marty Machowski beckons families to take time out from the daily grind to be transformed by the message of the Good News in his latest release, The Gospel Story Bible: Discovering Jesus in the Old and New Testaments(New Growth Press, November 2011). About the Author: Marty Machowski is a Family Life Pastor at Covenant Fellowship Church, a Sovereign Grace Ministries church in Glen Mills, Pennsylvania, where he has served on the pastoral staff for twenty-three years. Marty leads Promise Kingdom, the children’s ministry of Covenant Fellowship. He is also the author of Long Story Short: Ten-Minute Devotions to Draw Your Family to God and the forthcoming Gospel Story Sunday school curriculum. He and his wife Lois and their six children reside in West Chester, Pennsylvania.